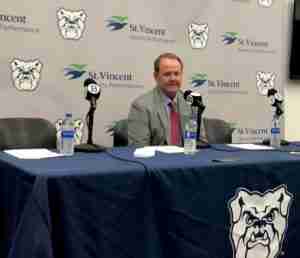 INDIANAPOLIS, IN — The Rebels dropped a game that featured ten lead changes Friday, losing to Butler 83-76. Terence Davis scored 30 points, but perimeter turnovers and foul trouble sealed the fate for Ole Miss (1-1). Despite the loss, first year head coach Kermit Davis appeared to be in positive spirits. 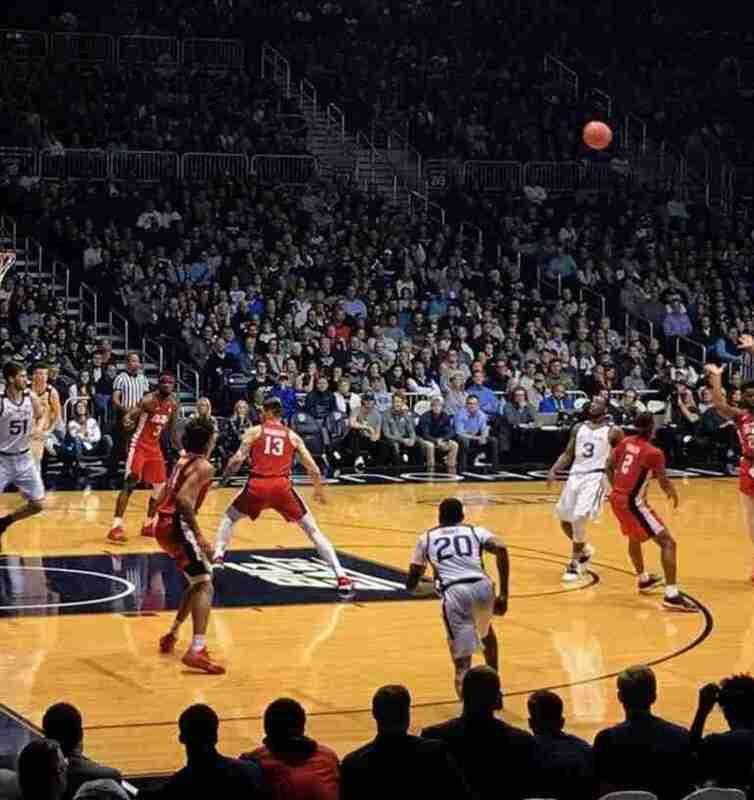 In a game that stayed close throughout and featured ten lead changes, as well as ten ties, Ole Miss took a late second half lead, but a late Butler run proved too much for the Rebels, as foul trouble and turnovers doomed the Rebels. Butler went 23/27 on free throws, as well as 18/18 from the line in the second half to seal the deal for the Bulldogs. 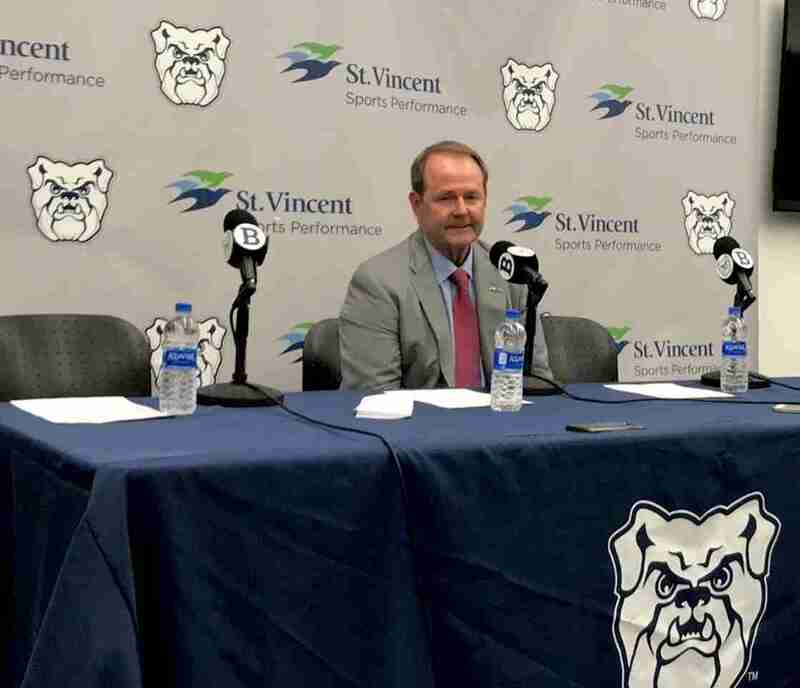 Ole Miss on the other hand struggled from the line, shooting 13/21, and that, combined with losing the turnover battle 16-10, and a few defensive lapses kept the Rebels from upsetting Butler on their home court. Ole Miss held Butler’s National Player of the Year candidate Kamar Baldwin in check in the first half, but could not keep him off the line in the second, where the junior finished with 23 points on 5/17 shooting, but 12/12 from the line. Butler guard Paul Jorgensen torched the Rebels from the perimeter en route to 27 points on 10/17 shooting, including 6/10 from 3. “We guarded (Baldwin) from the field great, but didn’t guard him from the line very good,” Kermit said. The Rebels kept up with the Jorgensen onslaught with production from senior Terence Davis Jr, who scored 30 points on 10/16 shooting (6/9 from three), as well as 4 rebounds and five assists. Davis scored in a multitude of ways, including off catch and shoot opportunities, dribble drive penetration, step back jumpers, and even a few post moves–a long way from a player who struggled to find himself on the floor his first year on campus. “I never was a top-100 kid (coming out of high school), but just being in the gym and working on my game is starting to show,” Terence said. Breein Tyree added 17 points for the Rebels on 6/11 shooting, and hustle plays from freshman KJ Buffen (9 points, 3 rebounds, 1 block, 1 steal) kept the Rebels in the game, but in the end, Ole Miss fell short. Ole Miss, a team predicted by the media to finish last in the SEC, played to the wire on the road with a team many consider to be a safe bet for this year’s NCAA tournament. However, Coach Davis made it clear the Rebels are not satisfied with just playing good competition close. Ole Miss will have another chance to beat Butler next year when they visit The Pavilion. As for this year’s team, they take on Nicholls State Tuesday in Oxford before heading down to Niceville, Florida to play in the Emerald Coast Classic, a tournament the Rebels won in 2014. Matt Barnthouse has over seven years experience working at the youth, high school, and Division I levels of basketball, and currently is at University of Cincinnati as a graduate student and instructor, while doing consulting work, as well as freelance graphics for various Division I teams and players. Barnthouse spent four years as a student-manager with the Ole Miss Men’s Basketball team, helping them to four winning seasons, as well as an NCAA Tournament appearance in 2015. While at Ole Miss, Barnthouse assisted in all parts of basketball operations, including recruiting, on-court drills, analytics, and film. Following his four-year stint with the Rebels, the redshirt junior declared for the 2017 NBA Draft, where he went undrafted. After his Spring 2017 graduation from Ole Miss with a degree in Journalism, Barnthouse spent the summer as a basketball coach at Camp Androscoggin, one of the northeast’s oldest and most prestigious summer camps. Barnthouse resides in Cincinnati, Ohio, and spends his free time watching film and playing with his Corgi, Brady.